Why Invest In a Good Yoga Mat? Why Use a Yoga Mat at All? The best yoga mats combine the foam cushion of a fitness mat with the nonslip surface of a great running shoe to make the ultimate space for not only yoga, but all kinds of gym activities. They soften impact on joints, wick away moisture and provide a space that others know not to invade. Spending hard earned money should not be taken lightly, so getting the purchase right on the first try is always desired. To truly and confidently decide on the best yoga mat for you, it is helpful to read the following reviews and gather more knowledge before deciding on the right one for you. The best yoga mats investment choice goes to. . .
Let’s kick it off with our favorite yoga mat, the Jade Harmony Professional Yoga Mat. It is made of open cell natural rubber for an awesome grip with more resilience and comfort. It comes in 2 sizes (68 and 74 inches). It is light-weight at 4.5 lbs. Perhaps most exciting is how this company gives back. By partnering with Trees for a Future, they pledge to plant one tree for every mat sold. The mat can be easily cleaned with mild soap and water and may be the first yoga mat ever made. How can they claim that you may ask? Well Jade Industries has been making nonslip mats for area rugs since the early seventies. When legendary yoga teacher B.K.S Iyengar recommended one of his students remove the rug she was practicing on because she was slipping so much, the student began practicing on the rug’s nonslip mat. Years later, inspired by the need to help yogis deepen their practice and avoid slipping through yoga class, Jade started manufacturing yoga mats. Pretty amazing, right? The Manduka Mat is customizable and comes in a variety of sizes, all the way up to 85 inches long. It has a slip resistant texture on both sides of the mat and remains sticky even when wet. When searching for a new yoga mat myself, I was immediately drawn to this company when I read that all of their mats are zero waste sustainable. They also come in a variety of colors and make a fun and meaningful gift. The standard size mat is stylish and a great long term investment. The Gaiam Sol Dry-Grip Yoga Mat is another favorite of Bikram yogis with the motto, “better grip the hotter you get.” Its stay-dry coat wicks away moisture and seals out germs, odor and bacteria. If you have been to a hot yoga class, then you know how valuable that is! That is also extremely helpful if you ever wanted to loan your mat to a friend. You don’t have to worry about any germs or bacteria hanging on to it. It is also light weight and easy to throw over your shoulder on the way to class. It comes in 2 lengths (68 or 78 inches) to accommodate every yogi. And with 5 mm of cushion, it will keep your joints safe and comfortable. The mat is one of the highest-rated yoga mats on Amazon, and available at super deals. The mat is actually a hybrid of a nonslip mat with an absorbent yoga towel – ideal for hot yoga or any activity where you are more likely to perspire. Typically practitioners of hot or Bikram yoga need to place a towel over their yoga mats due to the sweat and humidity in the room. This mat already takes care of that, so you won’t be dealing with the towel sliding beneath you or even needing to go out and purchase that extra towel. The Aurorae Premium mat also comes with a 2 year money-back guarantee. The Youphoria Yoga Mat is designed for comfort with its high density memory foam. This would be a good fit for a restorative yoga class, because it would provide that extra padding when holding poses for several minutes. It features grip circles that prevent slipping and maintain stability, keeping you safe in more challenging poses. This also allows you to stay focused on the present moment in the pose, as opposed to be constantly readjusting because you feel like your hands are slipping. It is free of harsh chemicals, so no concerns about a distracting chemical smell while you practice. The mat comes with a free strap and 100% satisfaction guarantee. Like many of the best yoga mats listed here, the Zen Active Non-Slip Yoga Mat is extra thick at ¼ inch thickness. It provides a two-sided surface technology with one side designed to grip the floor while the other provides extra comfort and shock absorption for joints. Because it grips the floor, it is great for balancing poses where you need the stability, but could also be used for Pilates or other fitness classes. It is free of latex, metals and rubber, so no need to worry about any odors. It even comes with a free carrying strap and money-back guarantee. 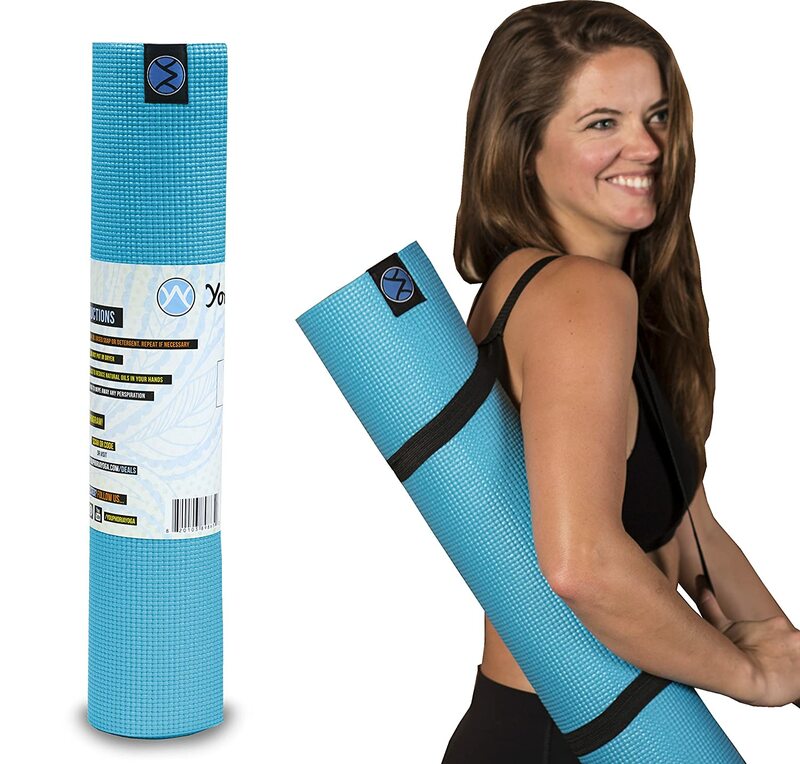 The YogaAccessories Extra Thick Deluxe Yoga Mat is comfortable at ¼ inch thick and free from latex and heavy metals. This means you shouldn’t notice any chemical smell like some other mats. It comes with a huge selection of colors including some two-tone mats. The vibrant colors make it a nice gift idea for your favorite yogi or athlete. And because of its extra-long size, you know it will work for anyone. It also comes with a lifetime warranty. If you have been looking for the best yoga mats for restorative yoga, the Sivan Health NBR Comfort Foam Yoga Mat is for you. Its nonskid ridges provide strong stability, while the memory foam absorbs impact and provides maximum comfort. This is ideal for a restorative class where you could be holding the same pose for several minutes. The BalanceFrom GoYoga All-Purpose Yoga Mat gives you a lot of bang for your buck! It is longer than the standard 68-inch mat, so is comfortable for yogis of all shapes and sizes. Yoga practitioners over 6 feet tall won’t have to worry about their feet hanging off the mat during relaxation post. Its high density foam provides extra cushion and support for yoga practitioners of all levels. This is helpful for beginners as they gain strength and more seasoned yogis as they deepen their practice. The All-Purpose Yoga Mat features a double-sided nonslip surface. You won’t have to worry about your hands slipping out of poses or the mat slipping underneath you. This is great for yoga, but also any floor exercise or stretch. This mat also comes in a variety of colors which means you can find the right one for your mood and personality. You won’t have to worry about someone mistaking your vibrant red mat as one of the gym’s community mats. It is also moisture resistant, which is great for hot yoga or more intense activities where you are more likely to sweat. Being moisture resistant also means it is easy to clean with mild soap and water. The mat comes with a free carrying strap, so it is easy to take to class and then can be stored anywhere at home. The Monster Fitness Yoga Mat is extra thick at ½ inch thickness. This is double or quadruple the thickness of most mats on the market! This would be ideal for beginners or yogis looking for the best yoga mats for bad knees. Extra padding can help you ease into poses that may otherwise be too uncomfortable on the knees or wrists. The thickness is also good for spine support. This mat is eco-friendly and latex-free. This means you won’t have to worry about any chemical smell while practicing. The Monster Fitness Yoga Mat carries a one-year money-back guarantee, which means you could give it a few tries to make sure it is the best fit for your practice. The best part about it is that it’s very affordable. The more info you have on what the best yoga mats for sale are all about, the greater your chances of getting it right the first time around. Read on to find out the answer to some of the most common yoga mat questions. Athletes and fitness enthusiasts of all kinds can benefit from yoga mats. Almost every gym across the country provides mats for classes, but there is nothing worse than relaxing your forehead into the mat during child’s pose only to notice the distinct smell of someone else’s sweat under your nose. In fact, the New York Times reported that gym yoga mats can hold onto many types of bacteria that cause athlete’s foot and other known skin conditions. Yikes! Definitely not a soothing thought walking into what should be a calming yoga class. If using a community mat, make sure to thoroughly wipe it down with the provided cleaning fluid, but the more sanitary route is definitely to buy your own yoga mat. Not only that, but buying your own mat is an investment in yourself. It is a commitment to use it, to try a new workout, to regularly go to that yoga class. When we invest in ourselves amazing things happen. So we have compiled a list of the best yoga mats for you and your practice. This questions gets posed most frequently by people who have never done yoga before, who may find yoga mats unnecessary. The truth is, the benefits of yoga mats should not be overlooked. These are just some of the basic reasons to use a yoga mat, among a great number of pros. The first purpose of a yoga mat is safety. Having a strong nonslip surface allows you to ease into yoga poses without being concerned about your hands or feet slipping out from under you. This is especially helpful for people who tend to have very dry hands that slip easily on hard surfaces. A thick yoga mat also provides extra comfort and padding. The best yoga mats for beginners are at least ¼ inch thick to provide more padding as they build strength. This will keep sensitive joints such as wrists more comfortable and safe. We want to be very mindful of avoiding any pain in our bodies during yoga in order to prevent injury. Providing a safe space with padding to absorb some of the impact off our joints helps us do just that. In addition to safety, yoga mats can be used for modifications. To avoid knee pain, many yogis choose to fold the yoga mat under their knees for extra padding. You could also try layering two yoga mats on top of one another for extra support and comfort. Rolled up yoga mats can also be used as props to ease into new yoga poses. Play around with the placement of your yoga mat until you achieve the right feel for you. Finally, the yoga mat creates personal space. Many yogis consider the mat to be a sacred space where they can escape from life’s everyday stressors. When we step onto our mats, we take a brief time-out from our to-do lists, anxieties and negative thoughts. We can give ourselves permission to stop doing and just be present in that space. At the very least, your yoga mat is a nice boundary when the person next to you is starting to getting a little too close in her half-moon pose. Traditional fitness mats do not provide the nonslip surface so tend to move when you are performing exercises on the floor such as sit-ups, planks, and other core work. They also break down sooner. Yoga mats are thicker and thus provide more comfort and padding on the spine when lying flat for sit-ups or Pilates workouts. When using a yoga mat, make sure you are using the correct side. Some brands specify which side is meant to be turned down towards the ground. Typically these mats are the best yoga mats for hot yoga when you are more likely to sweat from the poses and room humidity as they come with a moisture-wicking side. Hot yoga practitioners can also use a moisture-resistant towel on top of their mats. When purchasing a mat, make sure to take note of the return policy. Often it is impossible to know if you like the mat until you have practiced on it a few times. When you’ve been convinced that doing yoga and yoga-like exercises will require a good yoga mat, the next step is to find out what exactly to keep in mind when making the purchase. Look for the 100% satisfaction guarantee on the company’s website or product description. And if you’re wondering what to do with your old yoga mat when you are ready to buy a new one, there is a huge variety of ideas out there. From donating it to a homeless shelter to using it as a play-dough surface for your kids or simply using it as a pad for that area rug that won’t stay in place. There is always a way to breathe new life into a yoga mat that has seen better days. The best rated yoga mats tend to be thick (1/4 inch thick) but not too foamy. You don’t want to feel as if you’re sinking into the floor during downward dog. Discount mats tend to be about 1/8 inch thick, which does not provide enough cushion to be comfortable on your joints, especially sore knees or wrists. And never feel too afraid or awkward to give a potential new mat the sniff test. Many types of mats are made with polyurethane which have a nice nonslip surface, but can smell like chemicals. Cotton rugs don’t have the smell, but they also don’t have the grip to keep you stable. The natural mats made of rubber won’t have the chemical smell, but may have a strong rubber odor. The smell can wear off over time, but make sure it is not distracting during your practice. We hope this overview of the best yoga mats for 2018, and beyond, will be helpful for you on your search for your perfect sacred space and oasis from the rest of the world. We leave you with these key points. Remember to keep in mind what type of yoga you enjoy most to pick the right mat for you. Practitioners who enjoy hot, Bikram, Ashtanga and Vinyasa types of yoga should prioritize a nonslip surface, as they will probably be sweating during practice and want to avoid slipping hands and feet. For restorative yoga classes, opt for a mat with a thick, dense base at least ¼ inch thick, because you could be sinking into poses for several minutes. A thick mat is especially helpful if you experience sore knees or wrists during or after yoga class. Thicker mats are also great for any type of floor exercise when you want to provide more support to your joints. Regardless of what type of yoga or exercise you’ll be practicing, look for a mat that is more than 1/8 inch thick and carries some type of money-back guarantee. If you are not sure where to start, consider asking your yoga teacher or class friend to try a few poses on their mat. Finding the right yoga mat is a little like finding the right mattress. You won’t know what you like until you try a few different types. But make sure it serves you and your fitness goals. It’s always best to truly invest the time and money into the right yoga mat for you. Be wary of the discount mats you can find at the large superstores. When it comes to yoga mats, you tend to get what you pay for. The mat may be on sale for $8, but if it’s not going to even last a year without fraying or ripping, the $8 wasn’t such a great deal after all. Do your homework, try a few, and make the best decision for you. With many of the yoga mat companies carrying lifetime warranties, you know this piece of fitness equipment will be in your life for a long time!.